Not only was I able to get a jump start earlier last week, but we had a very productive day on Friday! It feels so good to already have so many of these items checked off as I enter 3rd trimester! In addition to stocking my freezer, I've also been working hard to get my garden all planted up. I just tilled the cucumber patch the other day and it is ready for seeds, as is the zucchini patch. All that's left to till is the corn patch. Once those three are planted, my garden is entirely planted, and all that is left to do is care for my hot weather seedlings indoors (tomatoes, peppers, watermelons) until some of my early spring crops are finished (ie. peas, turnips, radishes, etc.) and I have some garden space available for them. Another area I'm working on is Spring Cleaning! I've been attempting to follow along with Simple Mom's party, last week and this week, but there have been too many other things in my schedule to allow me to actually do it on schedule. It will likely still take me the rest of this week, plus all of next week, to get it finished up, but I'll just be happy to have it done, slower pace or not. One of these days, I'll post up a proper list of my "Before Baby To-Do's", so that you can see the things I'm working on (you can see my initial list here). I'm realizing that 12 weeks (give or take) really isn't very long, and so I am moving into high gear with my list, especially before I run out of energy! Baby is constantly moving around these days, which is such a joy, even when it keeps me up at night. 🙂 Abbie is constantly asking me whether baby is moving, so that she can feel, and I love her growing excitement about her new brother or sister. Caden has even begun to understand what's happening a bit more and offers the baby lots of kisses, although when we ask him where the baby is, he often still points to himself and says "baby!". I'm afraid he's going to be a bit surprised come August! still measuring right where I should be, so that's a good thing. The aches and pains are there, of course, but they're manageable and so worthwhile. The sciatica has so far not been as bad as my last two pregnancies, and for that, I am grateful! Maybe it's all that gardening! 🙂 I would appreciate any tips you that any of you ladies have for aching hips at night, though, as that is proving to be more of a discomfort this time than it has been with my last two babies. I've also been more tired than usual the last couple of weeks, and discovered why at my midwives today. I had this inkling that my iron was low, despite the fact that I had been supplementing up until just before the blood test I took last month. She confirmed that my iron stores are definitely low, so I'm going back on my favorite iron supplement, and will also be working to get enough iron in my diet through a bit of organic liver, other red meat, molasses, leafy greens, liquid chlorophyll, etc. Mostly, I am just growing more and more eager to meet this little one, as his or her imminent arrival becomes more of a reality all the time! Our talk of names has increased lately, and it will be interesting to see what name this baby is given. Though we've always chosen names primarily for their meanings (but also because we liked them), this time my husband has some different ideas. He would love to find a boy's name in honor of a godly man in history, and a girl's name reflecting a godly virtue. We have some ideas already, but I'd love to hear any that those ideas spark in you! Thanks for the update, I love reading about other women’s pregnancies! I’m 35 weeks with number 2 and really getting anxious to meet this little guy/gal! As for the hip issue – whew! I feel like my hips might come out of their socket at any moment. The only solution I’ve found helpful overnight is sitting on a heating pad before I go to bed. But, even then I can’t say it always works. My husband helps me stretch and we do a lot of walking, but there doesn’t seem to be any real lasting help. I’m 35 weeks pregnant right now and have had lots of trouble with my hips from early on. (I’m carrying this baby really low.) I had read over at Passionate Homemaking that her midwife suggested glucosamine for the hip pain as well as the ligament pain. I’ve been taking that as well as trying to be aware of the position I’m sitting in. I’ve noticed that if I’m sitting on a hard chair or stool for a while, when I try to get up and walk, I can hardly move because of the pain. So try shifting positions often, recline and put your feet up, stuff like that. And lots of prayer for strength and endurance! I’m at 30 and a half weeks (yes, I’m starting to count the half weeks in there as it gets closer)!! This is our first baby, so I’m experiencing all this for the first time. Our little guy is a wiggleworm and has decided the best time to kick mama in the ribs is while she’s driving (which can be rather disconcerting)!! My back and pelvis are getting the worst of it as far as pain is concerned…but I know it’ll be worth it in the end. My nanny job ends a week from today, so I really need to get a move on with getting the baby’s room ready for him, plus get the guest bedroom dealt with (the last place to organize from our move), PLUS get a lot of pre-baby prep done for around the house. I am looking forward to seeing your complete checklist…as I’m sure there are things I’m forgetting!! My favorite thing to do for my sore hips while pregnant was to kneel down, lean over an ottoman (belly hanging) and have my hubby roll tennis balls (lots of pressure) over my hips. Felt so good! I have no suggestions for your hips, but I know your pain. I’m glad to hear that it’s going to well for you! thanks for sharing…You look FANTASTIC! I slept with a pillow between my knees. 🙂 I’ve had my baby since your last pregnancy update, and broken my foot (!) but I remember the achy hips. I hope it gets better for you! I am 36 weeks prego and haven’t started my baking or cooking to freeze yet. You are definately on the ball. I have the sweet potatoe burritos on my list as well. I made them once b/f and we loved them. If you top them w/ salsa they are just unbeatable!!! Question, how do you store your tortillas? Do you make them and then put wax paper in between them? I was debating about making them ahead but wasn’t sure how to store them? the pains really got to me this last pregnancy too…I actually still have some residual pain from that. From some trial and error I figured out that these things helped me: sleeping with a pillow between my legs, and sometimes sprawling out a ton on the bed, which unfortunately meant my husband slept on the couch the last few weeks, not ideal but he wasn’t getting any sleep either…, also walking helped, even though it was hard to do, and having a warm bath before bed, and sometimes even in the middle of the day or night if I needed to. The last few weeks I was limping. Oh and not sitting for too long. Get up and move around if you have to be sitting for even like 20 minutes. At church I sometimes would stand at the back and sometimes even walk around back there. Names- good names are hard to choose! I don’t really have any ideas. I know we wanted names we liked the sound of for first names rather than just the meaning, but chose our girls’ middle names to have special meanings for us. I really wanted to use Hope as a middle name (for the hope we have in Christ) but my husband didn’t think others would understand. I needed more iron than I thought this past time too. oh I forgot…also getting on my hands and knees a lot helped. I actually gave birth like that and it really helped. I think a lot of my pain was from baby’s position (hand beside head). I had a lot of hip pain with my last pregnancy, and discovered during my last few weeks that sitting on a large balance ball and rolling around slowly really helped my hips, as well as taking pressure off my lower back, it also helped during early labor! I also would get on my knees and lean over the ball, while my husband massaged by lower back and hips. Those things, combined with warm baths during the night are what really helped me through my last two months of pregnancy. my hips were the thing with both pregnancies! with my most recent, i too, slept with a pillow between the knees but then also added a firm pillow behind my back. this seemed to help since i couldn’t sleep on my back but needed the relief from trying to keep myself on my side. surprisingly, it did help my hips a little and my back! i know God knows what he’s doing with pregnancy: He gives you the bright part in the middle, then allows you to feel a bit of misery so that by the time you’re in labor YOU’RE SOOOOOO READY!!! Stacey, I don’t put anything in between my tortillas, but I do leave them out on my counter, under a kitchen towel, for a couple of hours before I put them in bags and freeze them. I haven’t had many problems with them sticking together. Laura, that’s interesting about the memory foam. My midwife suggested getting an egg carton style foamy to put on my side of the bed, just to make it cushier for my hips. I might have to look into it! Kristina, I totally agree about the way that God created pregnancy. I think the misery (and the eagerness to meet our baby, of course) is exactly what makes us so ready to willingly do labor! LOL! 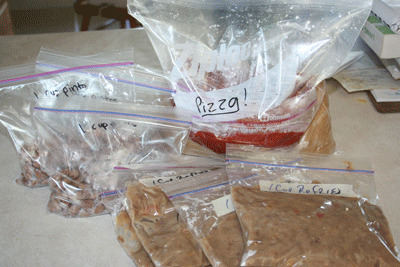 I’m LOVING your recipes on foods to freeze during pregnancy! This is my first baby and I’ll be making the transition from working class to stay at home mom. I’m excited to start fixing food and freezing it for later. I think I’ll need a new freezer. thanks for all your tips! I LOVE scowering your sight for useful frugal tips! Congratulations on your baby. 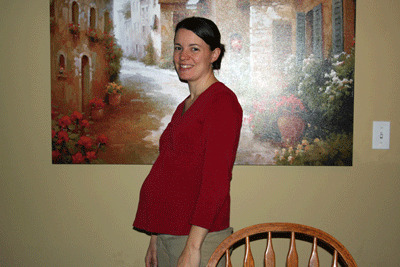 I am 9 wks pregnant and feeling like I am definitely in the first trimester! Do you do your own canning at all? If so, I found a very easy recipe for canning your own beans. 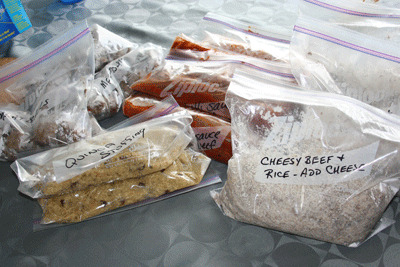 It doesn’t take up room in your freezer and they are ready to go when you are. I canned quite a few quarts of beans just to have on hand. This is so cheap when you buy the beans in 25-50 pound bags compared to buying canned beans at the store in tiny cans. This recipe is very fast, no soaking or cooking of the beans, but I did sprout some of my beans just for ease of digestion later. 1. Measure 1 1/4 C. dry beans (pinto, black, white, kidney) into each clean quart jar. 2. Measure 1 tsp. salt into each jar. 3. Fill jar to neck with water. 4. Process in pressure canner per manufacturers instructions. Also, do you happen to know if apple cider vinegar is okay to drink in pregnancy? I have terrible digestion when I’m pregnant. I take HCL and enzymes with meals and still have pain. I tried taking some ACV in water and it did seem to help. I think it’s generally safe, my main concern is whether it causes you to detox. Wow, these comments are so helpful! I’m about 16 weeks into my third pregnancy, and the back and hip pain has already been really difficult to manage. I’ve been using a heating pad in the evening, and I just started doing some yoga exercises right after I put my kids to bed, and it’s really helped. I don’t have the night time pain from extra pressure on the hips yet, but the memory foam or egg crate sounds like a great solution. Thanks for the tips, and the inspiration to work ahead. You look great, Stephanie! I love virtue names! My favorites are Comfort, Prudence, Patience, Mercy and Verity. This is my first time commenting on your site (I love talking baby names–heehee)–I am a new mama and have gotten so many great ideas and inspirations here–thanks! After my babies were born, I became a pilates instructor. So, I wish I had known more about exercise and stretching during the pregnancies. I have a sciatica issue also. Essentially, our quadriceps (large leg muscles) are really getting used during this time and the hips are loosening up quite a bit. If you could have a massage on your legs, specifically the quads and hips, this would really help. Also, if you could do some stretching on your back (I know this is hard with a big baby) it may help with the tightness in the hips and legs. Also, a full body pillow that you can sleep with, helps relax the hips during the night. (One leg over the pillow–hip’s width apart). Hope this helps. I totally had the hip thing with my pregnancies but it never occurred to me to say anything to my midwife. It did help to put a pillow between my legs at night. It’s so fun to see the older ones react to the younger ones. I had my twins at home (before we could even call my widwife) and it was so neat when the older three woke up the next morning. They were so full of wonder and delight! Pregnancy is ALWAYS an exciting time! Even on the days when you feel the worst, it is still so exciting that their is a little life coming into the world through you! I like the way you choose names… We have tried to do similarily – Joseph, for the Old Testament Joseph, and Elsie for a Godly great-grandmother. It’s something that we all need and I find it sweet for a girl. These are the names of my children. Evelyn, it means “life” (like Eve), it was also the name of my husband’s grandmother. Joshua, it means “the LORD is salvation”. Lillian, it means “purity”, and also both my mother and my husband’s mothers’ names are Susan which means “lily”, so we thought it was kind of neat that we were naming her after our mothers in reverse (well, her nick-name). Names are so personal. It’s funny how one person can love a name, and another will not like it at all. God already knows this baby’s name. You’ll know it when you hear the name! My hips bothered me during my last pregnancy too. I had to sleep on the couch for a couple weeks propped with pillows for my belly and the back of the couch propping my back. Surprisingly, it worked wonderfully! Although my hubby complained about missing me!!! Praying you’ll find some relief soon! Debra, I do lots of canning, though I haven’t ventured into pressure canning yet. I actually borrowed a pressure canner in the hopes of using it with beans, but I’ve just found it so simple to freezer them that I haven’t bothered yet. Thanks for the instructions and reminder to try it, though! Jena, thanks for those tips- much appreciated! Hannah, wow, that must have been quite an expensive to have twins at home without even your midwife! I can imagine how delighted your children must have been! Antonella, I love the name Grace, too… so much in fact that we’ve already used it! 🙂 My daughter’s name is Abigail Jennifer Grace. Kelly, thanks for reminding me that God already knows the name for this baby. Sometimes the names stress me out, but you’re right. When we find the right name, we’ll know. Before you buy a memory foam, simply try a quilt, folded in half like a sleeping bag. It helps me sleep a lot better. Also, if you do get sciatica, I’ve found wearing track shoes inside the house makes my days and nights way less painful. Just plain sitting on an exercise ball when at the computer, etc. seems to help the hip thing a lot too. Hope it helps! quick comment re. the low iron — i have read often that it is good to avoid eating dairy along with meat as the dairy can block the absorption of the iron from the meat. i’ve read that it’s good to eat them at least a few hours apart. ok…what are soaked tortillas? i make my own flour tortillas and i love them, but i have never heard of soaked tortillas. also how long did it take you to make 72 of them? that takes me at least 2 hours of non stop rolling and cooking. i wont go back to store bought but i sure wish i could find an easier way to make them. thanks and good luck with baby #3. i am 31 weeks with our 4th a girl we are naming PIPER.